One of the greatest things about William Shakespeare’s plays is how eminently adaptable they are. They have so many layers and are so timeless that they seamlessly move through eras allowing for stagings in an almost endless variety. Which, while not always successful, does bring these wonderful plays to new and disparate places culturally. 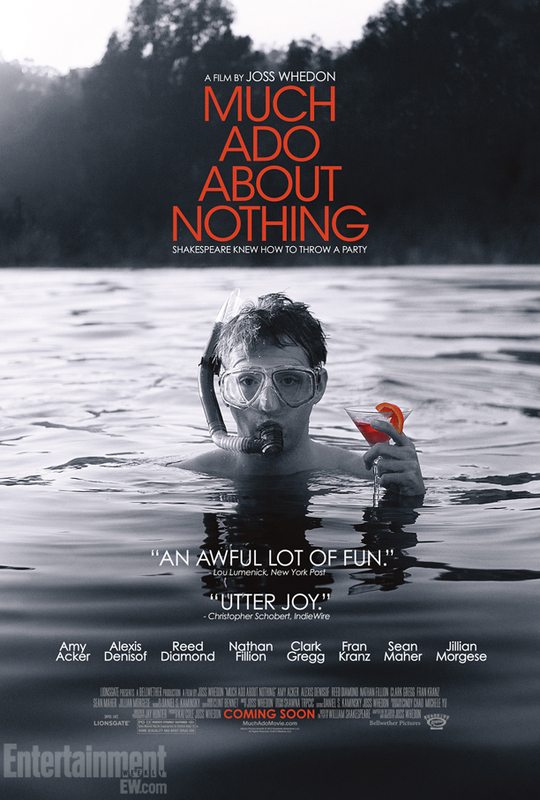 Geek media royalty, Joss Whedon is our adapter this time as he brought all of his actor friends to his home (which serves as the set and is GORGEOUS) and filmed this modern retelling of Shakespeare’s ode to the love that hides under hate. The black and white photography and the use of The Bard’s words are the only “throw back” elements while everything else is thoroughly modern day. Having seen many adaptations of Shakespeare in the past, locking into the speech wasn’t so difficult, although the obvious modern setting surrounding this very specific type of dialogue does make you feel like everyone suffered some sort of group head injury for a second. “Why are they speaking like that while holding iPhones?” your brain rightly screams. But, slowly that cognitive disconnect subsides and you’re overwhelmed in capital “A” Acting! The true stars of the piece though are Amy Acker and Alexis Denisof’s “Beatrice” and “Benedick” the sharp tongued and sarcastic hearts of the story. Acker and Denisof have undeniable chemistry, as any fan of Whedon’s Angel– where they starred as star-crossed lovers Wesley and Fred- well know. This film however begs the question of why is Acker not a bigger star? Her Beatrice is basically amazing and is by a large margin simply the best thing about this movie. In a film full of great, perhaps star making, performances (particularly Fran Kranz’s “Claudio” who transcends his Dollhouse IT nerd “Topher” and lands in the neighborhood of romantic lead and Clark Gregg, who with this, Marvel’s The Avengers, and the upcoming TV series Agents of S.H.E.I.L.D. is quickly becoming Whedon’s spirit animal) my hope is that Acker gets the most momentum following this project and becomes a household name as she deserves.